Kolkata: Whatever its eventual outcome, political history was made at Trinamool Congress chief Mamata Banerjee's giant rally in Kolkata on Saturday where she brought together more than 25 top leaders from 23 parties from across the country with one common objective -- unite to oust the BJP. Some concrete ideas emerged from four hours of deliberations in front of a huge audience-- a committee to draw up a common manifesto; a campaign against the electronic voting machine, which was labelled a "chor machine"; and a one-is-to-one fight that involved pitting just one opposition candidate against the BJP in each seat. "Modi Babu's expiry date is over," thundered Mamata Banerjee, speaking right at the end. "You know every medicine has an expiry date. The expiry date of the BJP is over." "In the last 70 years, Pakistan's dream was to somehow break up this country, divide the country. What Pakistan failed to do in 70 years, Modi and Amit Shah did in five," said Delhi Chief Minister Arvind Kejriwal. "If they win the elections in 2019, India will change. They will change the constitution, they will stop elections. I shudder to think. But having come to this rally, I am sure their good days are over." Akhilesh Yadav, Samajwadi Party leader, was also scathing in his criticism of the government. "The BJP has 40 allies. As the polls approach, you are making allies of the CBI and Enforcement Department also. But we are making an alliance with the people, and in a democracy, the people have the last word," he said. Mr Yadav also did some political arithmetic. "In Tamil Nadu, they will get zero. It will happen in Bengal too, and after the BSP-SP tie-up on January 12, the BJP is wondering how they will even get a single seat," he said. Some of the most biting attacks against the BJP came from of its own. Former Union Minister Arun Shourie slammed the Modi administration, saying: "There is no debate that this government has to go. No government has lied so much, no government has destroyed institutions, no government has neglected the defence sector more. The corruption in Rafael is the biggest." And then, for good measure, he added, "Demonetisation was a lunatic idea." BJP leader Shatrughan Sinha raised the Rafale question. "I am not saying that anyone is guilty, I am not saying anyone is innocent, but if you keep suppressing the truth, then people are bound to say that chowkidar chor hai." The Congress gave up trying to maintain some distance from Ms Banerjee's initiative. MP Abhishek Manu Singhvi praised her move and termed the BJP as a "vengeful" government. Party leader Mallikarjun Kharge read out a message from Sonia Gandhi, which said that 2019 was not going to be an ordinary election. And then he delivered his own little punch. "To save the country, the constitution and secular traditions, we must fight together. It's not difficult. But I will say that while the destination is very far, the road is difficult and even if hearts can't meet, let hands meet," Mr Kharge said. He had arrived late for the event, after intense trouble-shooting in Bengaluru. Rashtriya Janata Dal leader Tejashwi Yadav was also delayed because he had to make a court appearance. "Modi will lose his sleep. BJP Bhagao, Desh Bachao (Drive away the BJP, save the nation). I thank Mamata Banerjee for uniting us. Our chowkidar (watchman) must understand that he may be the chowkidar, but the people of this country are his thanedaar (senior officer). If he does wrong, the thanedaar will punish him," he said. He was taking a dig at PM Modi, who had described himself as the chowkidar of the national treasury a few years ago. But Ms Banerjee, like the other leaders, said that the prime ministerial choice was a post-poll call. And she was so confident of a BJP debacle that she invited all the leaders present at the venue to Kolkata for a mega post-poll rally. "We are not makers of history, we are made by history... so said Martin Luther King Jr years ago. Today, the Brigade Parade Ground bore witness to a bit of both. A whole galaxy of opposition leaders has made history ahead of the 2019 elections," she said. The BJP is watching, and it promises to be a bitter battle to the end. 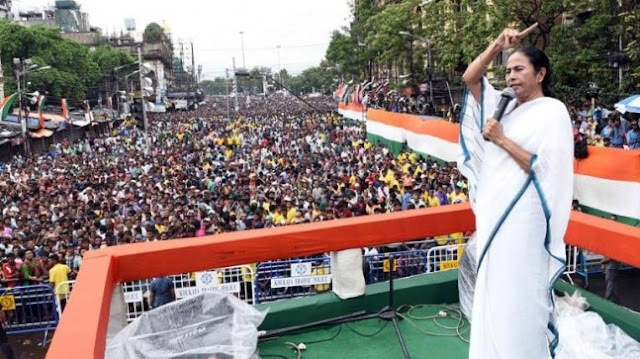 Whatever its eventual outcome, political history was made at Trinamool Congress chief Mamata Banerjee's giant rally in Kolkata on Saturday where she brought together more than 25 top leaders from 23 parties from across the country with one common objective -- unite to oust the BJP.